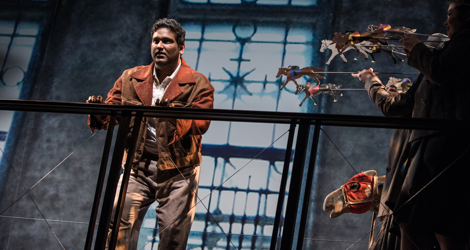 On May 28, 2016, Tapestry Opera presented the world premiere of the chamber opera Rocking Horse Winner, a co-commission with Scottish Opera. 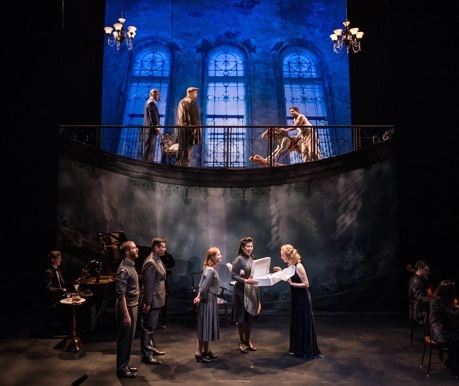 The opera, based of D.H. Lawrence’s 1926 short story “The Rocking-Horse Winner”, has a libretto by Canadian actor and playwright Anna Chatterton and a score by Irish-Scottish composer Gareth Williams. The immediately attractive work projects both sensitivity and assurance and receives an elegant production helmed by Michael Hidetoshi Mori. Rocking Horse Winner is the fourth collaboration between Tapestry and Scottish Opera. The opera was conceived in 2011, two years after Gareth Williams and Anna Chatterton met at Tapestry’s International LibLab in 2009, a project to bring composers and librettists together. It was developed during Williams’ residency with Scottish Opera. The choice of D.H. Lawrence’s short story was Williams’s and it is an excellent subject for operatic treatment since mysterious voices are an inherent part of the story. In the original the young boy Paul becomes obsessed with solving the “bad luck” that his distant mother Ava claims has prevented them from having enough money. The family does, in fact, have enough money to live on, but the kind of social position Ava wishes to hold requires more money than her small income can sustain. The mother’s need is so great that it imbues the whole house and eventually the house speaks to him in voices only he can hear. They urge him to ride on his rocking horse until he reaches a transcendent state where he is able to name the horse that will win the next major horse race. Chatterton’s libretto updates the action to the present and changes Paul from a child to a young man with autism. She also changes the gardener Basset in the original into Paul’s caregiver. Dramatically, the story is one of increasing tension as Bassett and Paul’s Uncle Oscar clearly take advantage of Paul’s hard-won tips on the horses for their own gain. Paul’s goal, however, is to put an end to the voices of the house that keep whispering, “There must be more money. There must be more” and thereby to win back his mother’s love. Williams begins the work with a vocal quartet hidden behind a scrim representing the voices of the house who first sing in abstract syllables. Gradually, the rhythm resolves itself into waltz time to represent the past while on the upper level of Camellia Koo’s stylish two-story set, singers mime the earlier happiness of the family and Paul's receipt of the rocking horse as a gift. Flashing forward to the present, Williams has Paul’s mother accompany herself on the piano, part of the onstage piano quintet that makes up the chamber ensemble, by playing a repeated tone cluster to which she sings in arioso fashion of her unhappiness, “Nothing is as it should be.” Throughout the rest of the work such clusters on the piano came to symbolize how Ava’s heart has closed to love and hardened into simple greed. During her first reflections the House begins its chilling refrain, first whispered, then sung, “There must be more money” that only grows more insistent throughout the action. Paul’s exchanges with the adults in his life, often to the accompaniment of extended single notes or chords from the strings, often have the same wan, resigned quality as the dialogues in Debussy’s Pelléas et Mélisande. This dominant mood of gloom is broken only by Paul’s wild trance-inducing rides on his rocking horse and by the raucous scenes at the race track. Williams’s idiom uses the various styles of minimalism from Glass, Adams, Reich and Pärt for different symbolic purposes – Glass to signal the general aliveness of the house, Adams for the rocking horse rides and the races, Reich for the harmonies of the House’s voices and Pärt for Ava’s quietest reflections. Yet, what blends these various styles into such a pleasing whole is Williams’s overriding gift for melody. The piano quartet when allowed to play on its own reminds one of the romantic sweep of the piano quartets of Fauré, only with more modern harmonies. Williams even gives Ava an extended aria near the end giving the singer a chance at last to sing at full voice and display her full range. As Ava, Carla Huhtanen sinks deep into her role. She has always been able to colour her gloriously pure soprano to suit her character, and here, quite appropriately she edges it to its iciest tone. Huhtanen is also a fine actor and she brings out all the complexity of the feelings that course through Ava when she realizes her son has sacrificed himself for her happiness. Newcomer Asitha Tennekoon is ideally cast as Paul. He displays a tenor with an Italianate sound but on a fairly small scale, perfect for capturing the notion of Paul as a adult who in some ways is still a boy. His plaintive exchanges with his mother and his desperate rocking horse rides win him unstinting empathy. One only wishes that he had an extended aria like Ava. The roles of Bassett and Uncle Oscar are small but Peter McGillivray with his resonant baritone brings out the suspicious kindliness of the former, while Keith Klassen’s brassy tenor conveys the venality of the latter. The most remarkable character of all is the House itself. The quartet of tenor Sean Clark, baritone Aaron Durand, mezzo Erica Iris and soprano Elaina Moreau not only blended beautifully with each other but often merge their voices almost imperceptibly with the piano quintet to eerie effect. In Camellia Koo’s inventive set, the upper level, depending on Michelle Ramsay’s moody lighting, doubles both as Paul’s bedroom and as the grandstand at the racetrack – an ingenious idea since the two places are so tightly linked in the story. Michael Hidetoshi Mori directs with admirable clarity. He is especially effective in making the quartet representing the House mysterious. At first they are unseen, then gradually through Ramsay’s lighting we see flickers of their faces and eventually their whole bodies as their influence over the action grows greater. Jordan de Souza conducts with vigour and passion. Rocking Horse Winner is one of those rare cases of a new opera on a familiar subject where one cannot imagine how the story could have been better told. The admirable succinctness of Chatterton’s libretto combined with the variety and allure of Williams’ music makes this a work that deserves to find the widest success. Since Rocking Horse Winner runs only 70 minutes, let’s hope for another collaboration between Chatterton and Williams to create a second one-act opera to complement the present work on a double-bill. Photo: (from top) RHW Asitha Tennekoon as Paul; (top) Keith Klassen, Peter McGillivrayt, Asitha Tennekoon, (bottom) Stéphane Mayer, Aaron Durand, Sean Clark, Elaina Moreau, Erica Iris and Carla Huhtanen. ©2016 Dahlia Katz.